The Palestinian Detainees’ Committee reported, on Thursday evening, that detainee Mo’taz Mohammad Obeido, 38, from the southern West Bank city of Hebron, has received a six-month arbitrary Administrative Detention order without charges or trial. The Committee stated that the detainee, who was abducted on February 5th, 2018, already spent six months under the same orders, and was supposed to be released today, but was instead slapped with a new order despite his serious medical complications. It is worth mentioning that the detainee, born in 1980, is a married father of three children; he was previously imprisoned by Israel for 33 months which he spent the Ramla prison clinic until his release on November 9th, 2015. 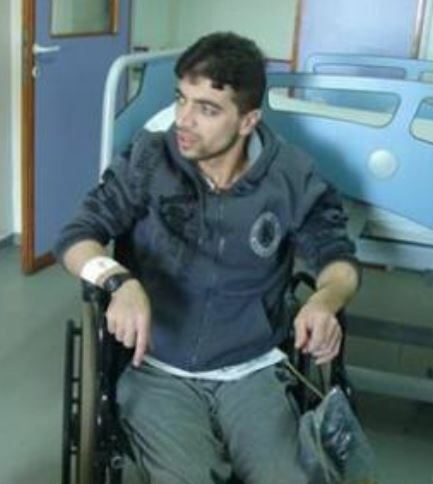 In 2011, and just before the soldiers abducted him from his home, he was shot by the army with expanding bullets, which led to damaging his bladder and intestines, forcing him to permanently need a urine bag and a colostomy bag, in addition to paralysis of his left leg. Israel is holding at least 6500 Palestinians, including around 350 children and six elected legislators, in addition to around 1800+ who suffer from various health issues, among them 700 cancer patient who require urgent and professional medical treatment, and dozens with various physical or psychological issues.